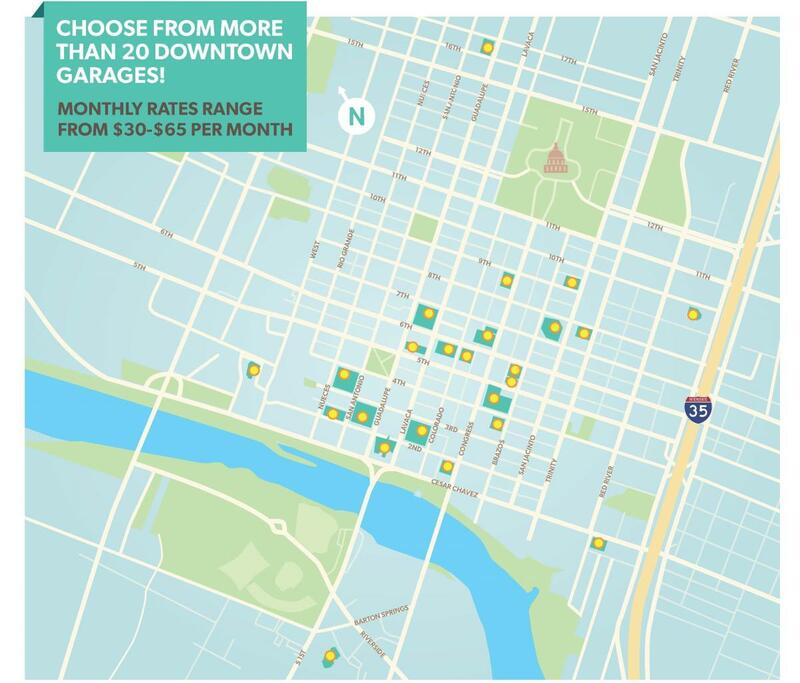 The Affordable Parking Program is a City of Austin and Downtown Austin Alliance initiative aimed at reducing economic barriers for Austin service and entertainment industry employees. Park at affordable monthly rates as early as 3 p.m. and stay as late as 7 a.m. during the week, and park up to 24 hours during the weekend, depending on the garage. Click the image above for an interactive map of all Affordable Parking Program garages. Address: 301 W. Second St. Address: 505 Barton Springs Rd. Hours: 5 p.m. – 5 a.m. Mon. – Sun. Address: 625 E. 10th St. Hours: 6 p.m. - 5 a.m. Mon. – Sun. Address: 300 San Antonio St. Hours: 4 p.m. – 3 a.m. Mon. – Sun. Hours: 3 p.m. – 7 a.m. Mon. – Fri. and all day Sat./Sun. Address: 300 W. Sixth St. Hours: 4 p.m. – 7 a.m. Mon. – Fri. and all day Sat./Sun. Address: 112 E. Fifth St. Address: 211 Walter Seaholm Dr. Address: 421 W. 3rd St. Hours: 5 p.m.– 7 a.m. Mon.– Fri. and all day Sat./Sun. Hours: 5 p.m.– 7 a.m. Mon.– Fri.and all day Sat./Sun. Hours: 4 p.m. – 6 a.m. Mon. – Fri. and all day Sat./Sun. Address: 140 W. Cesar Chavez St. Hours: 4 p.m. – 5 a.m. Mon. – Fri. and all day Sat./Sun. Address: 500 W. Second St. Address: 206 E. Ninth St. Address: 201 W. Fifth St. Hours: 6 p.m. – 5 a.m. Mon. – Fri. and all day Sat./Sun. Note: Customers cannot be enrolled students. Passes must be purchased at any staffed garage. Hours: 5 p.m. – 7 a.m. Mon. – Fri. and all day Sat./Sun. To sign up: Contact Avarie Anderson with Stream Parking at Avarie.Anderson@StreamRealty.com or 512-481-3045. Address: 117 E. Ninth St. Address: 1759 W. Sixth St.